MMX Gallery is pleased to announce Dado, a solo exhibition by Andy Wicks. Dado examines the grand domestic proportions of MMX Gallery against that of the ‘white cube’ through a site-specific installation. The Dado rail traditionally served to protect walls from scuffs off the backs of chairs and furniture. But like many period interior features has become kitsch and outmoded in the age of plasterboard and shadow gaps. In this, Wicks’ 2nd solo exhibition he reinstates the Dado within the gallery space in the form of a 45° split batten hanging device. The rail acts as a lineal geometry tracing and scaling the extremities of the space whilst simultaneously facilitating display. 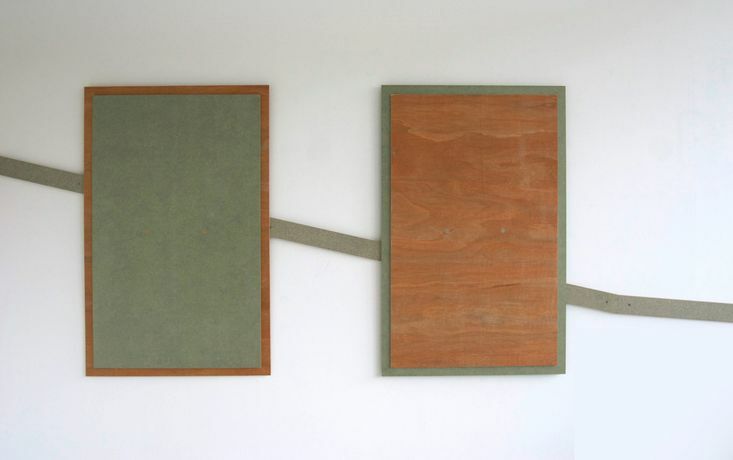 A series of wall based objects or constructed paintings explore the blurred edges between media and continue Wicks’ appropriation of functional and utilitarian materials. Having seen his practice broaden over recent years from painter to a wider concept lead approach, Dado could be seen as a return of sorts to the language of painting. Employing techniques more familiar with carpentry Wicks works sheet materials to create a body of work taking cues from American Abstraction and Minimalist movements by way of B&Q. Andy Wicks was born in 1983 in Kent and lives and works in London. Forthcoming and recent exhibitions include – To Fill A Void, APT Gallery, Deptford, Feb/Mar ’15: Other Rooms, Basement Art Projects, Leeds, Jan ’15; Deptford X Festival 2014; Trade, Castor Projects, London, 2014; Interchange Junctions, 5 Howick Place, 2014.